Since the birth of the term, ‘Sino-African Relations‘ which refers to the historical, political, economic, military, social and cultural connections between China and the African continent, China has moved in heavily on the continent, promising aid in different forms in exchange for resources and manpower. Much like the colonial times when European countries forcefully took the land, the Chinese have modernized this process by using economic and social strategies to slowly buy and own large aspects of Africa’s economy as the countries incur more debt from financial aid China renders. Most African countries build this relationship to help reshape their systems from its present third-world state and for some it does work but the government with its corrupt loopholes allow the Chinese government benefit more from the arrangement than the African people involved. Countries like Kenya which has been praised for its recent economic boom in areas like tech and infrastructure owes a large portion of it’s growth to the relationship it has with the China government acting like an as adopted parent for the country’s issues, policies, and cultural state. The unbalance created by the Sino-African partnership between Kenya and China which started around 2015 will have different effects on the new generation of Kenya, as China’s influence only grows stronger every year. Kenyan painter, Michael Soi son of one of Kenya’s most distinguished contemporary artist, who’s been featured on the cover of the Art Africa Collectors edition, had his work selected as one of eight Kenyan artists for the prestigious Bonhams charity art auction in London and awarded several overseas fellowships is conscious of the dependent nature of Kenya on China and has voiced his perspective through his ongoing art series ‘China Loves Africa’. My first inspiration is my city. What I aim to do is document Nairobi, creating what I describe as a social pictorial diary. Most of my work is a social commentary inspired by my city, addressing everything that we would rather not talk about in public. The role that China plays in Africa is also a strong preoccupation of mine. China is hungry for raw materials from Africa. Africa is poor and desperate. African leaders are seeking trade partners who will not ask questions; so in essence, China is Africa’s sugar daddy. – Michael Soi shared with Nini-Gallery. 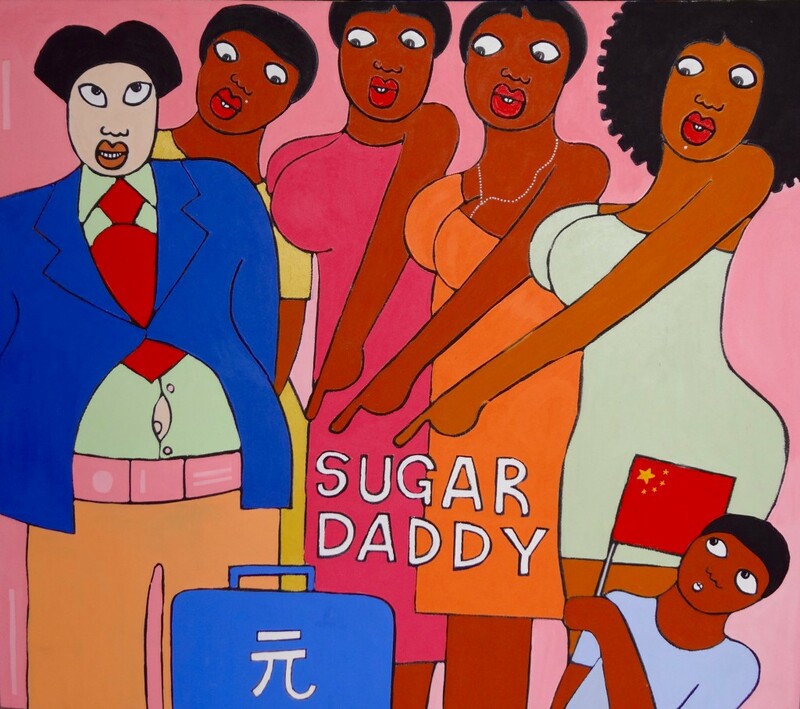 ‘China Loves Africa’ is a provocative collection of 74 bold visual pieces that critique China’s heavy involvement in Africa, using his art as a way of social commentary, his acrylics on canvas paintings tell a visual story that enrages conversations around the effects of this on the Kenyan demographic and how it shapes the country’s prospects. Chinese president Xi Jinping, is at the center of most of the pieces, in others, he depicts Africa as a woman being lured by China, mocking their contribution to the country. China loves Africa is a series that seeks to explore and talk about the interest that China is showing in Africa. This is work that is inspired by conversations with ordinary people down on the ground, business people who have come to love the Chinese. In a nut shell, it is a continuing conversation that is hard to ignore as an artist and social commentator. – Michael Soi Told Fader.